Summary : Tired of plain old green tea? If so, and you like a lemon flavored tea, then I suspect you may enjoy this creation from the Dragonwater Tea Company (now out of business)which nicely mixes a lemon flavor with traditional sencha green tea. Review : What is it about lemon? Once upon a time, I really didn't care for lemon at all. But then I was introduced to lemon water, and plain old boring water never quite tasted the same. And then I began to find lemon in teas, and well, let us just say that I've really come to like teas that have a lemon flavor to them. Because I've become a "lemon-a-holic" for lack of a fancier terms to use, I was quite looking forward to trying out the Sencha Lemon Ginger Green Tea that is put out by the Dragonwater Tea Company (now out of business). This tea contains the following ingredients : Sencha green tea blended with ginger, lemon myrtle, lemon grass, citrus peels, orange bits and chamomile. This tea has a really, really strong aroma. Indeed, I hadn't even opened up the package before I was greeted by a very, very strong lemon aroma. Of course, this is a very good sign for a lemon tea. Lemon has a strong aroma to it, and if you come across a weak lemon tea...well...you can usually judge how it will taste simply by the aroma, or lack thereof. Happily, the flavor of this tea matched the strong lemon aroma. Basically, this is a lemon tea, with a hint of a few other flavors thrown in for variety's sake. You can taste just a "wee bit" of the sencha green tea in the background, and if you are really searching you can also find a "wee bit" of the chamomile flavor too. But at the end of the day, this is a lemon tea, pure and simple. One thing to keep in mind about lemon and green teas...they are a perfect mix unless you overbrew it. In which case, well, you might as well use it as drain cleaner. Neither green tea nor lemon in non-herbal teas are especially delightful when overbrewed as both can develop a really nasty and bitter taste quite quickly. In short, the moral of the story is this...when brewing this tea don't overbrew it! 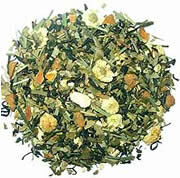 Overall, if you enjoy lemon herbal teas...have no fear, you will enjoy this tea too. And if you are simply tired of the various green teas, well, give this tea a try, if only for a "break from tradition," assuming you like lemon to begin with. I also think this tea makes for a nice entry tea for people new to green tea, although there are better ones for this purpose such as Tazo's Zen Green Tea. Recommendation : Yes. This tea at the end of the day is a LEMON tea, not a green tea...so keep that in mind. If you like other lemon teas, be it herbal or something else, then you'll almost certainly enjoy this one. On the other hand, if you and lemon are just not destined to like each other, then avoid this tea...because lemon is basically all the tea is, flavor wise! Brewing Instructions : Use 1 heaping teaspoon of tea leaves per cup. Pour water with a temperature of 180 degrees over leaves. Let brew for 1-2 minutes.